Play, Playfulness, and Permission: When and why do we give ourselves a go-ahead to play? Is playfulness available on demand? Suppose that you have just been asked to engage in a small task of some sort – say making some toy animals out of Lego blocks for a new children’s window display in a hospital. Imagine that you’ve been given several mixed assortments of six Lego bricks, and the coordinator of the display has also made an example of the sort of thing she has in mind: perhaps a small duck. She sets the sample toy in front of you, and then gives you some further instructions. How would you feel? What thoughts, images, or feelings would come to mind as you set about making the requested Lego ducks? Would you start to feel pressured and tense, a bit keyed up, narrowing your focus, giving yourself some “straight talk” about getting down to business (come on… let’s focus now!) or would you begin to wonder: What did she mean about being non-playful? Am I supposed to be efficient here? Does she want me to make lots of those same ducks? Exactly the same? Just copy them and get on with it? Imagine that these were the only instructions you had received. How would you feel? What thoughts, memories, feelings would spring to mind? How do you do something playfully? Can we simply be asked to take on a playful approach? Is playfulness an “experiential stance” that can be called up on demand? Setting out to explore these questions, two researchers from Denmark asked 22 young adults to take part in precisely these playful versus nonplayful Lego duck-building exercises. Then, right after they finished making their Lego ducks, the researchers asked each participant to take part in an in-depth video recorded interview in which each duck-builder was asked to freely and fully describe what they had experienced as the exercise unfolded. Looking through detailed transcriptions of the interviews, the researchers coded if – and also when – each participant spoke of different experiential aspects, such as their perceptions, or their actions, memories, feelings, or changes in the focus of their attention. Most of the participants spoke about how they consciously asked themselves about the meaningof the task. In the playful condition, many mentioned that the requirement to be playful meant that they were set free to do whatever they wanted to do. They had time and space to creatively make something inspired by their own ideas and intuitions, rather than something that was already spelled out for them. 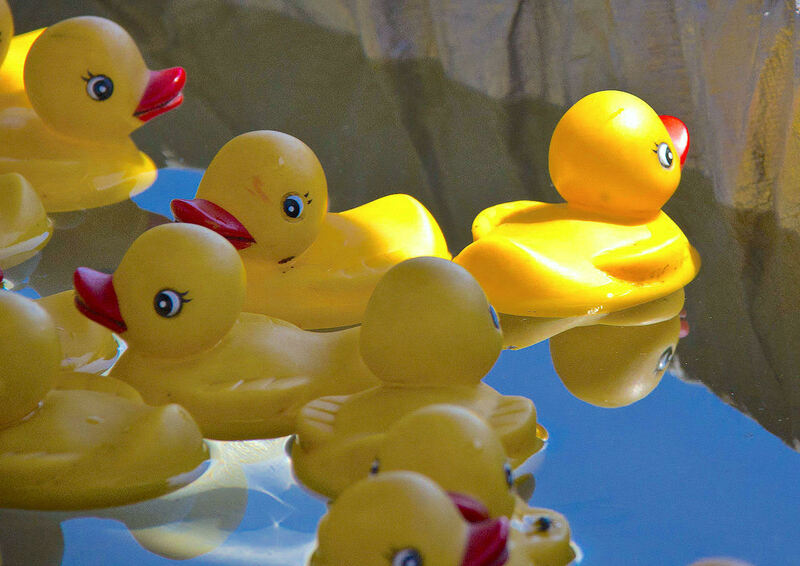 When they actually starting making the ducks, the participants in the playful condition often took a “let’s just mess about with this” sort of attitude, reminding themselves that “it’s not a competition,” fiddling with the pieces to see what might come about, and even sometimes making animals other than ducks. They spoke of how they liked the look and the soft satisfying sound the bricks as they firmly nestled into place, and of feelings of pleasure and surprise when they looked at what they’d made. Overall, 19 of the 22 participants said they were successfully able to take on a playful stance when they were asked to do so. It seemed that being prompted to play set in motion a positive cycle. The cycle was kicked off with a feeling of freedom from specific constraints and goals. This brought into a play an exploratory, curious, and open-ended “look-and-see” interactive approach to the materials at hand. This cycle was both accompanied by, and further activated by, positive feelings of sensory, aesthetic, and reflective pleasure. In turn, there were feelings of autonomous and intrinsic motivation, that opened the way to unexpected and surprising outcomes. The unexpected creative outcomes fostered expanding feelings of competence, which “looped back,” sparking further exploration and interactions. So where does that leave us? It seems, in principle, possible to simply and directly ask ourselves to become more playful, spontaneous, and exploratory. By prompting ourselves – and giving ourselves permission – we can creatively surprise ourselves. We can draw upon an untapped resource of playfulness to prompt a self-reinforcing perception-action cycle of making-and-finding. Intrinsic motivation can emerge from action. 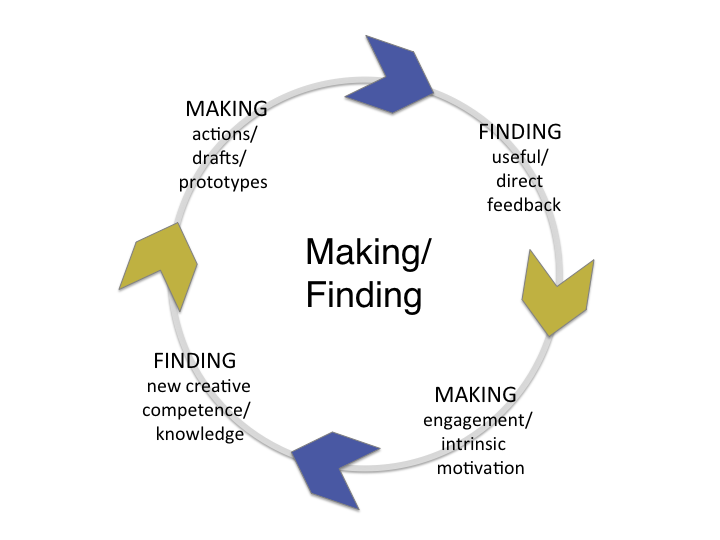 Source: Figure 4.4 from Koutstaal & Binks (2015, p. 152), Innovating Minds: Rethinking Creativity to Inspire Change. New York: Oxford University Press. What voice in your own head is ordering you to just make ducks? Is it a voice that you’ve chosen for yourself? Or is it an inner voice that just autocratically takes over, and automatically plays and re-plays itself at different times? If the voice isn’t yours, or isn’t fully yours, or plays through your mind unbidden at times you wish it wouldn’t, how could you counter that voice? What other voices could you imagine to give yourself the space – and the time and the permission – to be more playful? Heimann, K. S., & Roepstorff, A. (2018). How playfulness motivates: Putative looping effects of autonomy and surprise revealed by micro-phenomenological investigations. Frontiers in Psychology, 9,Article 1704, 1–15. Koutstaal, W. & Binks J (2015). Innovating Minds: Rethinking Creativity to Inspire Change. New York: Oxford University Press. —> Also posted at “Our Innovating Minds” Psychology Today.